So it came as a bit of a surpise when, a few months into our marriage, I realized that I had never made a pie for Fred. He was thrilled to know that I could actually make pies from scratch and immediately began to imagine the possibilities. “Can you make rhubarb pie?” he asked. Then Fred’s brain, straying into odd corners as it likes to do, began to explore other options. “What about onion pie?” he said. Then Fred’s eyes lit up and his face erupted in a happy smile–a sure sign that a terrible, terrible pun was at hand. With that, the spectre of the octo-pie began to haunt my culinary imagination. Surely there must be a way to make a savory pie using octopus, a delicacy we both enjoy. But the project stayed on the back burner until Fred’s most recent birthday. Preparing for a small dinner party to celebrate, I began scouring my cookbooks for ideas. 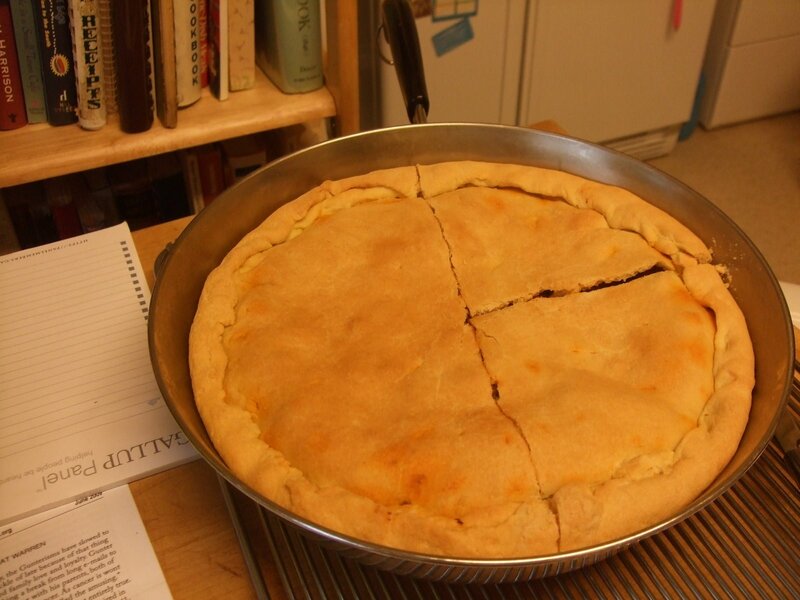 And when I pulled out my copy of Lidia’s Italy and flipped it open, there it was: Octo-pie. *I’ll describe where I got hold of the octopus in a future post. Dissolve yeast in warm water and let it sit for several minutes. Put flours, salt, and sugar in the bowl of a food processor and run the machine for a few seconds to blend the dry ingredients. Defrost the octopus, and put it in a big pot with several inches of water to cover. Add the bay leaves. Bring to a boil, and cook at a bubbling simmer for about 35 minutes, or until the octopus is tender but al dente. You should be able to pierce the flesh with a big meat fork but still feel a bit of resistance when you withdraw it. The skin of the octopus should still be largely intact–not broken and peeling off, which indicates overcooking. Let it cool in the cooking water, then drain well and cut it up into 3/4″ pieces. Rinse, core, and seed the plum tomatoes, and cut into 1/2″ dice. Pour the olive oil into a big skillet, set it over medium heat, and stir in the garlic. Cook for a minute, until sizzling, then add the octopus pieces and toss them in the oil. Scatter the olives in the pan, and cook for a couple of minutes, stirring and tossing; sprinkle in the peperoncino. When the octopus is sizzling, toss in the diced tomatoes, and season with the salt. Cook at the simmer, stirring frequently, for another 10 minutes or so, until the filling is dense and glistening, with no liquid left in the pan. Toss in the parsley, and cool the filling before assembling the tiella. Heat oven to 375. Arrange a rack in the center of the oven and put a baking stone on it, if you have one. Brush the bottom and sides of a 12″ oven-proof skillet, baking pan, or tiella pan lightly with olive oil. Deflate the dough, knead it briefly to form a round again, and cut off a third of the dough for the top crust of the tiella. The larger, two-thirds piece will be the bottom crust. Let the dough relax (especially if it has been chilled) before rolling. On a floured surface, roll out the big piece of dough to a 14″ round. Transfer the round to the skillet or baking pan, centered and lying flat on the bottom and sides. Trim the top edge of the dough neatly so it is an even height, about 1 1/2″, up the sides all around. Scrape the cooled filling into the bottom crust, and spread it in an even layer, slightly compressed. The bottom crust should extend at least 1/2″ above the filling all around. Roll out the smaller piece of dough to a 12″ round and trim it into a neat circle that is a bit larger than the layer of filling–use a ruler to get the right dimensions. Center the circle and lay it on top of the filling. Pinch together the overlapping edges of the bottom and top crusts all around. Fold this flap of dough inward and press it down and against the pan sides all around. Make uniform indentations with your fingertips, to seal the tiella tightly and create a decorative rim of dough at the same time. With the tip of a sharp knife, pierce the top crust all over with a dozen or so small slits. Finally, brush extra virgin olive oil all over the tiella, including the border of the crust. This entry was posted in Fish and Seafood, Our Life, Pies and Pastry. Bookmark the permalink. I loved your description of how you wooed your friends with your pie crust! Thanks, Ginny. Yes, exaggeration works wonders for improving your status. I wanted to let you know that I highlighted this post and your blog on our show “This Week on MyNC.” It airs at 5:30 a.m. Saturday and again at 9:30 a.m. Sunday and 11 a.m. Sunday on NBC17. Drop me an e-mail at ginny (at) 30threads (dot) com if you want more details! I love this post so much!